Crowded House vs OneRepublic Mashup - "Apologize To Me"
Well, after a fairly long absence I am back with this 3 minute fusion of one of the finest song writers in recent history, Neil Finn's 'Crowded House' and recent Timbaland buddies, 'OneRepublic'. I have been a fan of Crowded House for as long as I can remember and was lucky to see them live on the 'Woodface' tour many years ago. I thought the time was due for a Crowded House mash and so here is the first of a Neil Finn trilogy. Using the "Mean To Me" acapella and mixing with the Timbaland instrumental version of "Apologize", ladies and gentlemen.......for your listening pleasure.......I bring you.....divorce.......a padded cell.....and....suicide.......yes, not a happy mash this one but it might just bring a smile to your face !! It's at the usual address : http://www.bobbymartini.co.uk/ on mashups page 10. 100,000 Hits and Three New Vids to Boot ! 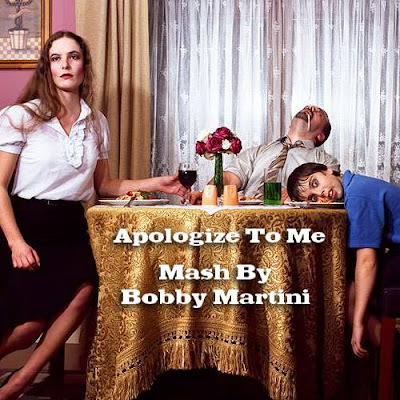 I have three new vids for you this week from official friend of Bobby Martini, Geoff Major. Geoff is a huge Sunscreem fan and runs the official YouTube Sunscreem channel. Geoff is very talented at producing remix/mashup videos and has produced 3 all new vids for my mashups. Starting with : "Here Comes The Sunscreem"
"People Hold On For A Quiet Life"
"Aint No Other Man Til You Get Enough"
A big thanks to Geoff for producing these awesome vids. You can check out all of Geoff's work on his youtube channel here.